It is not necessary for a film to have a point. But for one to be so pointless and clueless about its own existence makes for a supernaturally horrific experience for the discerning audience. It's the age of the crusades, times when witches are burnt at the stake. 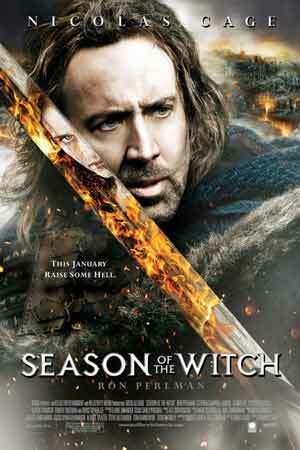 Behmen (Nicolas Cage) and Felson (Ron Perlman) are knights fighting and killing in the name of Jesus. But when they have to kill women and kids, they desert the religious army and try to wander back home only to be captured at a village that is in the throes of a plague. Here they are given the chance to redeem themselves by escorting a woman suspected of being a witch, to their main monastery. This one is a film full of loopholes, one of the main being that an opportunity for either suspense or to make a statement against the insanity of religious wars is royally wasted. The film would have become much more interesting if the first few minutes that show a witch with supernatural powers were removed. This would have left a doubt in the audience's mind, as it is not made clear throughout the remaining film whether the woman being escorted is indeed a witch. In the end, the film does pit the sins of the devil versus the sins and killing done in the name of Jesus Christ. Yet the dialogue at the end of the film where the devil makes a reference to this point ends up being nothing but a lame and desperate defence. The scenes and flow of the film are also unbelievably done. Yes, it is a fantasy film. But even a fantasy film is based on certain logic. It cannot simply function on the whims of the writer or director. For instance, whereas in the entire film it has been shown that the devil can move things by sheer thought, Behmen very conveniently manages to pin him down while another man reads the spell to destroy him. The only saving grace, if you could call that, is the cinematography and special effects, neither of which leave much to be desired. Finally you do end up wondering, what was indeed the point of the film even though you are perfectly okay with many films not having any point whatsoever.